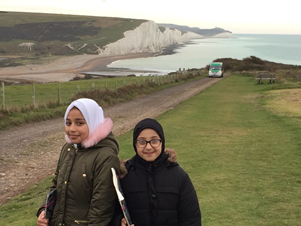 Ten lucky year 5 pupils recently spent 4 days in the South Downs on a poetry retreat with pupils from five other local primary schools. Every morning, they were up early exercising before embarking on a packed schedule of activities. 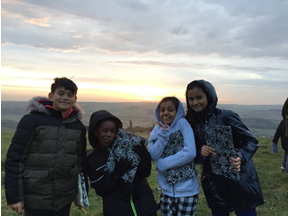 These included: a walk up a local hill where they experienced the beauty of nature, a trip to the beach followed by Frog Firle farm which was packed full of myths and legends, drama workshops and a visit to a professional recording studio to record their self-penned raps. Throughout the trip they were incredibly lucky to have Adisa the Verbalizer to guide them through their poetic journeys. Adisa enabled them to view the world from different perspectives, inspiring the children to record their creative ideas from which they could write their soon to be published poems. During the week, not only were the pupils constantly asked to step out of their comfort zones, but they were also encouraged to reflect and explore their own joys and fears. They can all be incredibly proud of what they achieved and how they not only coped, but thrived, making friends with and learning from their fellow Newham poets. Next >> Next post: Afia Choudhury, an inspiration for us all.